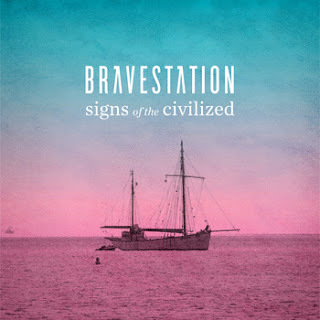 Gas Lantern Media | audio, video and words in review: Bravestation - "Signs of the Civilized"
"Signs of the Civilized" a new track from an upcoming, as yet unnamed, LP from Toronto's Bravestation is a fantasy wrapped in warm summer sun. While the band describes themselves as purveyors of "tribal pop," they're far more than guitars and steel drums or the driving beats of a war chant. Instead, with "Signs" Bravestation displays an incredible acuity to tap into the greatest elements of '80s era alternative, while also capturing the lush dream pop known to listeners of Beach House and similar acts. Now, Bravestation trends away from the dream, toward that fantasy I mentioned above, and I don't mean "swords and spells" fantasy either. Instead, the music is driven, purposeful and catchy, while still maintaining an ethereal quality that sets it aside some of Peter Gabriel's best. It's a fantasy because it feels like a transportation to another place and time. But the place is rooted earthly lyrics. And direct hopes for love. It's really even better described as yacht-dream pop, the kind of music that rushes through your hair like a sea breeze. If you're already completely confused, as I am, by my string of comparisons and similes, you should just listen to the track. It's hard to describe because it is a bit of a quilt of colorful, semi-impressionistic vibes and styles, the upside here is that "Signs" is as good to listen to up close as it is to take in all at once. Give it a listen and fantasize.